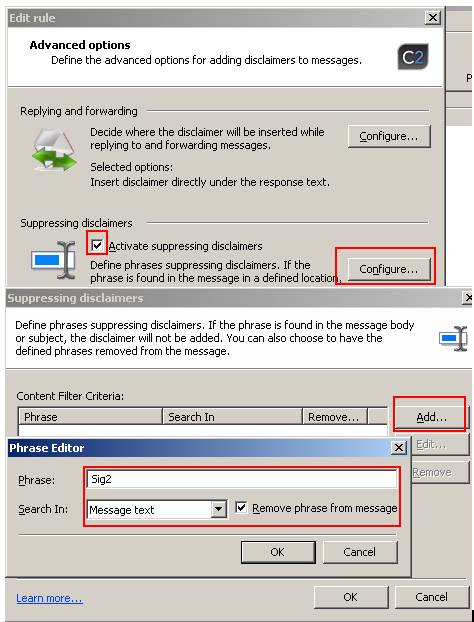 The built-in editor in CodeTwo Exchange Rules includes a functionality enabling quick and easy insertion of AD placeholders that are filled with data dynamically when the message travels through Exchange Server. Apart from the standard fields (e.g. First Name, Last Name, Company, Title Department), the AD button allows using extra placeholders, listed under Exchattr (click here to learn more about this option). If you combine extra placeholders and a suppressing tool of CodeTwo Exchange Rules you might be able to let your users decide which footer is to be added by the program and in each language. Let’s say your company is bilingual (English/Georgian) and both e-mails and footers have to be in two languages too. You will have to use additional fields in AD for each particular user when creating (or modifying) their personal information. These additional fields, as it was mentioned before, are called Exchattr and can be later used as placeholders to pull data from Active Directory. For example you can create a contact information for one user where his/her name will be in English and then add their Georgian (Mkhedruli) equivalents in, for example, Exchattr1 and Exchattr2 fields. Let’s assume you have two rules (two templates): Signature1 (English) and Signature2 (Georgian). Open CodeTwo Exchange Rules administration panel, select your first rule (Signature1), click Edit and go to Advanced Options. When you are there, check Activate suppressing disclaimers box and then click Configure. In the resulting dialog box, select Add, and set the phrase editor as shown in the picture below. From now on, if you write Sig2 in the body of your message, it will remove this footer (which is Signature1) leaving only Signature2 appended. You will have to do the same for the Signature2 but use Sig1 in the phrase editor. Obviously, the name of the phrase that suppresses a disclaimer depends only on your imagination. It is also possible to add more ‘signature-switching words’ but then the combination of phrases would be much more complex. Again, you only have to depend on your imagination and simple mathematics. You will have to enter two suppressing phrases to suppress two signatures, three to suppress three and so on. Remember that this tool is called the ‘suppressing tool’. We are also thinking of implementing an option that works the other way round and forces certain signatures instead of suppressing others. Do you think that option would be useful? Ok, this works in an either/or situation. I’ve tried it using sig1 and sig2. (and I like that it removes the phrase) Works great. Now how would it be done via sig1, sig2, and sig3 (or more)? I’m fiddling with the stop rules option and the phrase suppress but haven’t hit gold yet. Ahh.. How could you spill the beans! I felt like a pro when writing this ;) But it’s true.. I didn’t invent it myself. And the best part is that we didn’t know that :) One of the users told us about it. Thank you!